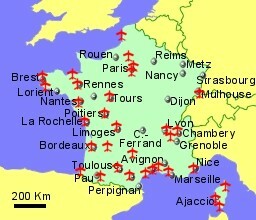 France has long been a favourite destination for flights from the UK and Ireland. The reasons still exist - romantic cities, rugged north west coastlines, Mediterranean south coast, many wine growing regions, excellent food, and of course, winter sports in the Alps and the Pyrenees. The French island of Corsica is also well serviced with airports. 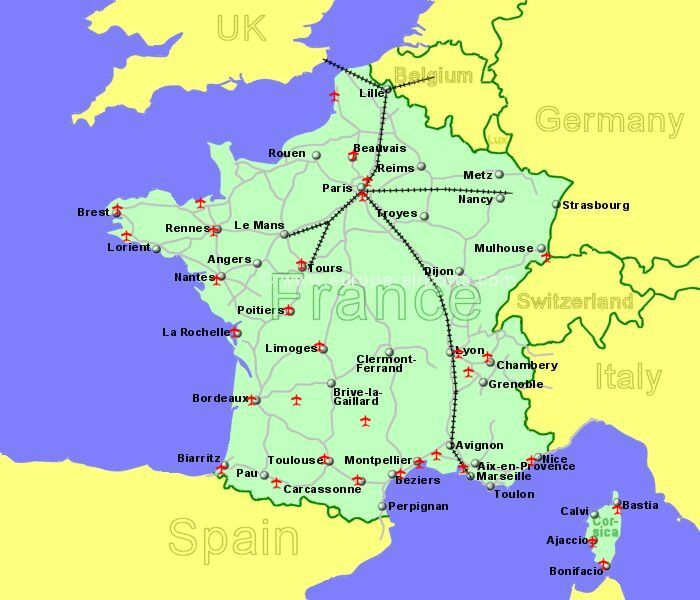 You will find flights to France being provided by major airlines, low-cost airlines, and due to the relatively short distances involved to some airports, some very small airlines. The climate will vary from being typically Mediterranean in the south, to something similar to southern England in the north. France is a member of the European Union and the currency is the Euro. France is also a Schengen country. Located 6Km East of Ajaccio, on the west coast of the island of Corsica, the fourth largest island, and popular tourist destination,in the Mediterranean. Located 7Km South East of Avignon. Avignon sits on the banks of the river Rhone, 60 Km inland from the Mediterranean and the Camargue. Located 15 Km south of Bastia, on the North East coast of Corsica. Bastia is one of the most beautiful towns on Corsica with the old quarter dating from the 14th century. Located 4Km South East of Bergerac, 80Km East of Bordeaux, in the Dordogne. Bergerac is a market town known for its tobacco products and wines. Located 12Km East of Beziers, serving the Languedoc coastal area of the country. Located 2Km South West of Biarritz, in the Bay of Biscay, on the Atlantic coast of France. Located 12Km West of Bordeaux, on the western coast. Bordeaux,the capital of the Aquitaine region, is a port city considered to be the wine capital of the world. Located 8Km North West of Brest, in the North West corner of the country. Brest is the second largest city in Brittany, known for its craggy coastline and beautiful beaches. Located 18km south of Brive-la-Gaillarde, in the Limousin region of France. Located 6km west of Caen city centre, on the Normandy coast. Located 4Km south East of Calvi, North Western Corsica, the popular french Mediterranean island. French wine and cuisine on a Mediterranean island. Located 40Km North East of Grenoble, near the western end of the Alps. Chambery airport is near to alpine ski resorts. Located 4Km South West of Dinard, 10Km South West of St Malo, on the north Brittany coast. Located 4 Km south west of Dole, 40Km south east of Dijon, eastern France. Located near Figari, 15Km South West of Porto-Vecchio, the third largest city in Corsica, on the southern coast. Beautiful beaches with mountains inland. Located 30Km North West of Grenoble, on the western end of the Alps. Grenoble is in the Rhone-Alpes region of France, home to around 200 alpine ski resorts. Located 5Km north west of La Rochelle centre, on the western coast. La Rochelle has a well preserved old town and harbour. Located 2Km east of Le Touquet, on the north coast. Located 6Km North West of Limoges, in the Limousin region. Limoges became famous for its craftwork, particularly enamel and procelain. Located 8 Km south west of Tarbes, 10 km north of Lourdes, close to the Pyrenees in southern France. Located 24Km East of Lyon in the Rhone-Alpes region of south west France. Located 25Km North West Marseille, on the southern coast. Marseille, on the Cote d Azure, is the second largest city in France. Located 8Km south East of Montpellier, the capital city of the Languedoc-Roussillon region, on the south coast. Located 20Km south east of Mulhouse, east France, against the border with Switzerland. Located 6Km South West of the centre of Nantes, the capital city of the Pays de la Loire region, north west France. Located 7km South West of Nice, in the heart of the Cote d Azure on, the south coast (French Riviera). The historic city of Nice is a major tourist centre and Monaco is 20Km to the north east. Located 12Km South of Nimes, on the south coast, near the Camargue National Park. The city of Nimes has a rich history dating back to Roman times. Located 26Km North East of the centre of the capital city, Paris. Located 14Km South of Paris centre. The second largest airport at Paris and closest to the city centre. Located 3Km North East of Beauvais, 75Km North of Paris. Located 5Km North of Perpignan, close to the Spanish border, giving access to the northern Costa Brava. Located 2Km West of Poitiers in the Poitou-Charentes region, western France,halfway between Paris and Boreaux. Located 5Km South West of Quimper, on the west coast of Brittany. Located 10Km South West of Rennes, in the heart of (and the capital city of) Brittany, with good access to the motorway network. Located 10Km North West of Rodez, in the Midi-Pyrenees region. Located 15Km South West of Strasbourg, capital city of the Alsace region. Strasbourg is situated on the river Rhine, close to the German border. Located 3Km South of Hyeres, 23km east of Toulon, on the South coast, at the western end of the Cote d Azure, south east France. Located 6Km West of the centre of Toulouse, in the Midi-Pyrenees region. Toulouse airport gives access to ski resorts in the Pyrenees. Located 4Km North of Tours, in an area well known for its vineyards and the wines they produce.